Campbellsville, KY- 4/7 - The Underwood Motorsports Race Team is set to begin battle in the Modified division for 2003 in the Central Kentucky region, with team driver Jason Underwood back at the controls again this season. The 23 year old, second generation pilot will start his fifth season of action in one of America's most competitive classes, the open wheel modified division. 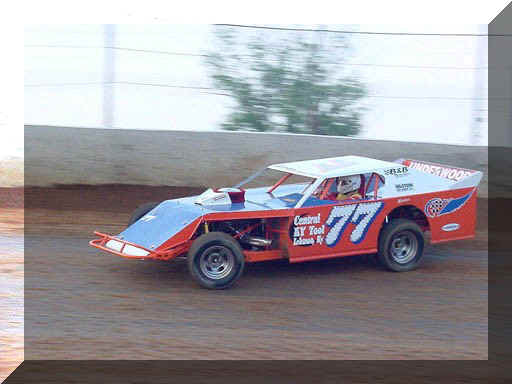 One of the state of Kentucky's top former Stock and Limited Modified go-kart racers, Underwood goes into the 2003 season wheeling a Bandit Race Car entry, with a Dale Meers Race Engine under the hood providing horsepower for the #77 orange, blue, and white mount. The 2002 racing season was a learning campaign for Underwood Motorsports as the team got accustomed to a new race car and experienced some of the "bugs" of new equipment, but the group was still able to manage a 13th place finish in the Modified track points at Bluegrass Speedway in Bardstown, KY, which has become a "hotbed" track for Modifieds in the Kentucky area. The goals of Underwood Motorsports for 2003 are to be competitive at each track they race at and to present a professional image both on and off the track. Bob Underwood assumes the role of car owner and crew chief for the team again in 2003, with Mike Dudgeon and Gerald Stamp providing assistance in the wrench turning department, with body and chassis assistance from Jeff Watson. The team will begin the 2003 race season on April 19 at Bluegrass Speedway in Bardstown, KY.
Providing sponsorship on the Underwood Motorsports #77 Bandit Race Cars entry for 2003 are Central Kentucky Tool of Lebanon, KY, with other sponsorship opportunities available with the team.